Injuries to scrum-half Rhys Webb and full-back Leigh Halfpenny cast a shadow over Wales' World Cup preparations as they beat Italy 23-19 in Cardiff. Webb twisted his left leg under pressure at a ruck, and underwent six minutes of treatment on the pitch. 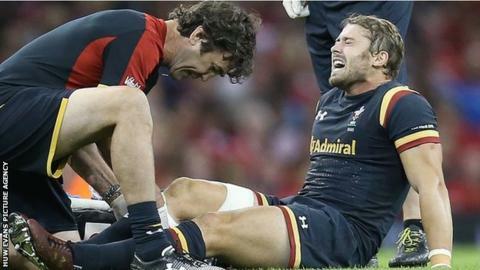 Halfpenny turned his right knee in the 69th minute while trying to field a kick. Leonardo Sarto and Lorenzo Palazzani scored Italy's tries, with George North touching down for Wales. But with three weeks to go before Wales play England in the World Cup, the injuries will have far more impact than the result of this lacklustre and disjointed match. Earlier Halfpenny had kicked five penalties to become the third player to pass 500 points for Wales. Relive Wales' final World Cup warm-up match as it happened. Injuries were Wales' biggest worry going in to the match, and the loss of Webb and Halfpenny realised those fears on a disastrous evening for coach Warren Gatland. The Toulon full-back's right leg was already heavily strapped when he collapsed with no-one near him. With his natural replacement Liam Williams recovering from foot surgery, the injury could be a major headache for Gatland. Ospreys scrum-half Webb has been one of Wales' stand-out players in the past year, crossing for five tries in 16 internationals and was Pro12 player of the year. Wales have two scrum-halves in their World Cup squad, with Gareth Davies and Lloyd Williams already selected, but the injury could pave the way for a return of Mike Phillips. The 94-time capped Racing 92 scrum-half was left out when Gatland reduced his training group from 46 to 38 in August. With Davies and Williams boasting only 22 international appearances between them, Phillips's experience might sway the decision. On a day when England were 21-13 winners against Ireland, Wales did little to worry their Pool A opponents. Opting to run penalties and keep the ball alive, they were undone by handling errors and a combative Italian back row led by the imperious Sergio Parisse, who was making his 113th appearance for his country. His presence meant Italy were a different proposition to the team beaten by Scotland last week and hammered 61-20 by Wales in Rome in March. A shaky scrum was another hindrance for the Welsh, who will have serious concerns about their set-piece with England to come on 26 September, after the opening match against Uruguay on 20 September. Wales started badly and barely improved. Parisse's interception of Alex Cuthbert's pass ended a promising Wales move in the second minute with the Italian number eight eventually hauled down just short of the line. But Wales were short-handed and Sarto took advantage. The home team replied with a superb North try and a Halfpenny penalty, but Allan kicked two penalties of his own to keep Italy ahead at the interval. Wales played more conservatively after the break with Halfpenny adding four penalties before leaving the field and fly-half Dan Biggar slotting one. Replacement Palazzani touched down with the last play of the match to reduce the deficit to four points. Wales coach Warren Gatland on Halfpenny and Webb's injuries: "They don't look too good at the moment, but we'll just have to wait and see." "If they are ruled out it's a massive blow for them and it's disappointing for us but sometimes you got to put that behind and work with the layers you've got and build them up move on to the next game. "When we get the results back we may have to sit down and start thinking about replacements but until then there's nothing concrete in our heads." Wales: Halfpenny, Cuthbert, Allen, S. Williams, North, Biggar, Webb, Jenkins, Owens, Francis, Ball, Day, King, Warburton, T. Faletau. Replacements: M. Morgan for Halfpenny (69), G. Davies for Webb (26), James for Jenkins (53), Dacey for Owens (68), Jarvis for Francis (63), Charteris for Ball (53), Moriarty for T. Faletau (63). Italy: Masi, Sarto, Morisi, Garcia, Venditti, Allan, Gori, Rizzo, Ghiraldini, Castrogiovanni, Geldenhuys, Furno, Zanni, Minto, Parisse. Replacements: Palazzani for Garcia (65), Canna for Allan (58), Aguero for Rizzo (52), Manici for Ghiraldini (75), Cittadini for Castrogiovanni (41), Bernabo for Furno (65), Vunisa for Parisse (65).